Yet more evidence that the weather is behaving in a very unseasonable way – the smolts are running. Over the weekend we noticed salmon smolts in our leat and by Sunday morning they were in the forebay. This is the earliest we have seen them “run to the sea” since we built the hydro scheme. Maybe the migration is due to the warm weather or perhaps the summer river levels? Whatever the reason we had the fish pipe open for 24 hours and they have all successfully continued their journey past us. Let’s hope in 2 or more years time they will be back in the rivers to spawn and start the species life cycle again. Signs of spring are showing themselves everywhere but one of the plants I eagerly look for each year is the Early Purple Orchid with its distinctive spotted leaves. 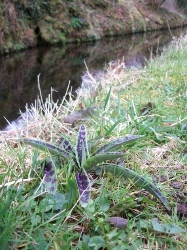 They are appearing along the leat side now. The trees are slowly showing signs of the coming season too with buds just forming and catkins in abundance. The dawn chorus is loud enough to be our alarm call at this time of year, the owls let us know they are busy too during the night and the wood pecker is very actively drilling into trees during the day - no doubt to find food or a suitable tree for nesting in.